Given the long night/morning as noted in my previous post, Sunday was not going to be an action-packed day. We had decided to watch the NFL playoff games while recovering and then head out to dinner after that. We also had a craving for a burger, and it turned out for some unknown reason, the local Burger King delivered. Fascinated to see how that process would work, I called the Palermo location to place an order. Unfortunately, a deadly combination of my tiredness, a terrible phone line and their lack of English led to this being a very arduous process. After being passed off to three different people, they finally told me our address was outside of their delivery area. Oh well. It was hot and humid once again so finding a place close was paramount. I spotted a cool looking cafe only a few blocks away called Local and after looking at the small but intriguing menu, we sat down to eat. I love small, local restaurants so this was perfect for me, made even better by The Beatles Greatest Hits playing in the background. Our very cute waitress turned out to speak almost flawless English. She was from Spain so her accent had a slight British quality to it. She suggested we try their wood oven specials and both of us chose the chicken. By now, I’m used to waiting 30 plus minutes for the meal to arrive. I don’t mind this as long as it was and Local would prove to be exceptional. 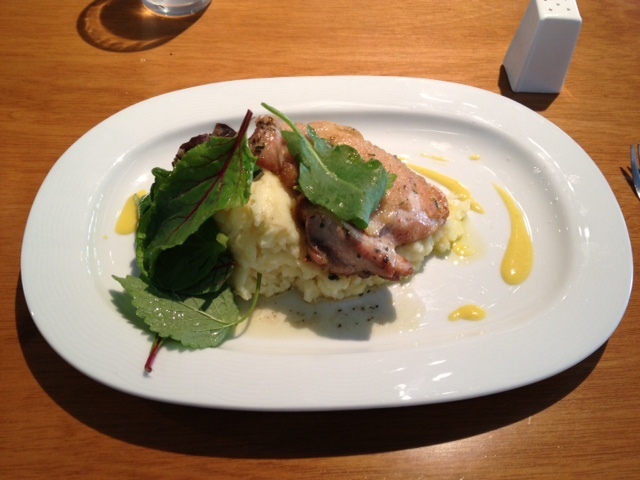 The chicken arrived with stunning plating and an aroma that made me want to eat it right away. The skin had been roasted to crispy perfection with a healthy dose of fresh herbs. The bones had been removed and the breast was perfectly juicy. It was quite simply one of the best chicks I had ever had. I will come back here multiple times. By the time we got back to the loft, it was time for the first playoff game. However, as we changed from channel to channel it was nothing but the other kind of futbol. As it turned out, the first game was terrible so we took advantage by having a much needed siesta. We assumed that at least the second game would be showing but nope, even more futbol. D’oh! Trying to find something to watch, we stumbled across one of the local new stations – C5N – which was doing an exhaustive live remote from Mar del Plata to talk to people at the beach. What followed was one of the most bizarre live news segments ever. The main reporter was wandering around the beach interviewing/interrogating women – mostly asking if they were single and if they would off their bikini for the camera – very creepy. Other hard hitting interviews included a group of people using their car battery to power their portable speaker and other random questions to people who clearly didn’t want to be bothered by this weirdo. The cameraman was either focusing his lens on asses, looking at a boat on the water, or trying to peek down the bikini tops of the women being interviewed. This went on for over 20 minutes, broken up occasionally by the main anchor, back the in studio, asking the reporter questions. It was awesome to watch. We wanted to catch at least the 2nd half of the Redskins/Seahawks so we took the short cab ride to a place called Sugar, which was a sports bar for ex pats near Plaza Armenia. There was a lively group of Redskins fans and a lone Seahawk fan that were enjoying the game on a projected screen. The feed was DirecTV’s online option so there were occasional buffering issues but still decent overall. Still craving a burger, we both ordered the Sugar Burger and began tempering our expectations that it would be a good one. That turned out to be the case as the burger arrived after almost 40 minutes and was average at best. After the game, we walked over to a craft brewery I wanted to try called Antares. Before the trip, I had pretty much resigned to not having any beers as weak tasting lagers would be the options. However, it turned out that Antares had several varieties including IPA, Barley Wine, Porter and Imperial Stout. I selected the barley wine and the imperial stout as half pints given their high ABV. The barley wine was pretty damn tasty, just the right amount of hops. There’s another Antares in Las Canitas that I will check out soon. Posted on January 7, 2013 by reyalto. Bookmark the permalink.